The year 2013 marks the 90th anniversary of The Texas Collection. To say that the landscape of human history has changed since 1923 would constitute a most severe understatement. During the twentieth century, humanity has witnessed the carnage of two World Wars, the space race, the creation of the television and Internet, civil rights movements, and the atomic age…just to name a few changes! Repositories such as The Texas Collection have taken up the mantle of preserving this history and cultural heritage. We are one of the largest Texana collections in the nation, but this accomplishment would not have been possible without the generosity and vision of its first donor, Dr. Kenneth Hazen Aynesworth. Aynesworth was born in Florence, Texas, on February 9, 1873. He earned his undergraduate degree in 1894 from Baylor University, where he was classmates with famous Texans Tom Connally and Pat Neff. Aynesworth went on to earn his medical degree from the University of Texas at Galveston in 1899. His work in the field of medicine opened up a wide variety of opportunities for Aynesworth. While earning his M.D., he interned at John Sealy Hospital in Galveston. 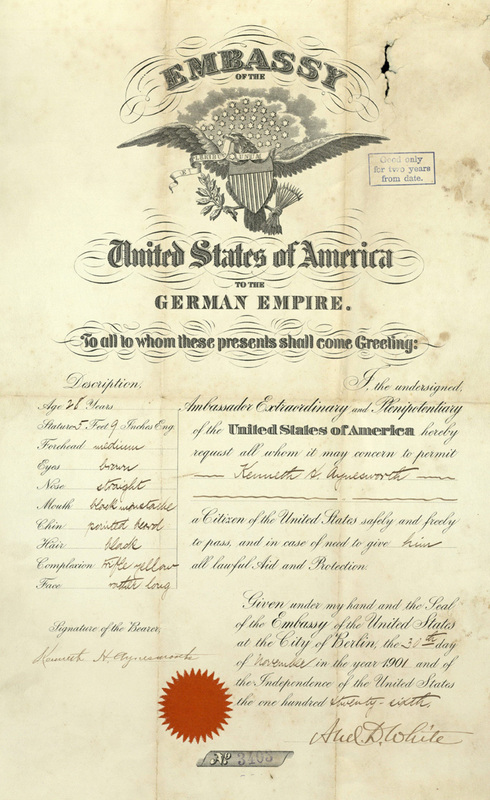 In 1901-1902, Aynesworth pursued postgraduate studies at the Friedrich Wilhelm University in Berlin. Seven years later, Aynesworth traveled to Johns Hopkins University for continued research. After marrying his sweetheart Maude Brian on December 31, 1902, Aynesworth began his own private practice of general surgery in Waco, Texas. For more than forty years, Dr. Aynesworth practiced medicine in the Waco area, primarily at Providence Hospital. Despite his busy work schedule, Aynesworth was involved in a number of medical and local organizations including the Waco Board of Health, the Waco School Board, the Waco Planning and Zoning Commission, and the American College of Surgeons. 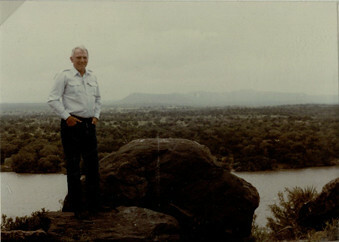 Kenneth Hazen Aynesworth was an avid collector of local, state, and national history. This periodical, one of a series of documents, details the destruction of the Spanish fleet at Manila Bay during the Spanish-American War of 1898. But in addition to all of that, Dr. Aynesworth was a collector of history, especially that of Texas. In 1923, he donated hundreds of items to Baylor University in order to found The Kenneth Hazen Aynesworth Texas History Collection. To ensure the collection was properly funded, Aynesworth contributed to the institution on an annual basis. His gifts also supported the salary of an instructor to teach Texas history, which was not being taught anywhere else in Texas at the time. It only took a year or two of Aynesworth’s donations and that of others before the Dallas Morning News hailed the collection as a “Mecca of Historians.” After a time, the name of the repository was changed to the Texas Historical Collection, which later became The Texas Collection. 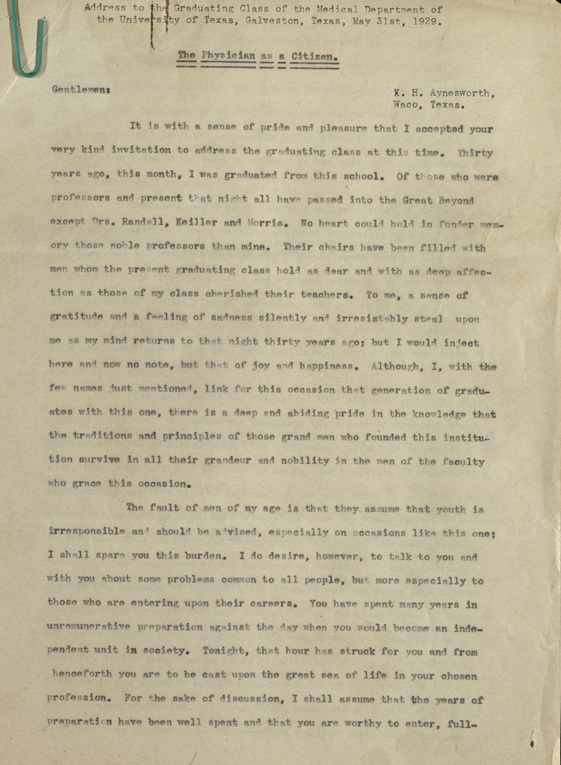 “The Physician as a Citizen,” address given by Dr. Kenneth Hazen Aynesworth to the graduating class of the Medical Department of the University of Texas, Galveston, May 31, 1929. This speech exemplifies Aynesworth’s philosophy of supporting one’s community and living a well-rounded life. Aynesworth personified much of what it meant to be a well-rounded citizen during the early half of the twentieth century. In addition to working hard at his profession and maintaining his civic involvement, Aynesworth gave of his time and finances to preserve the history of his day. 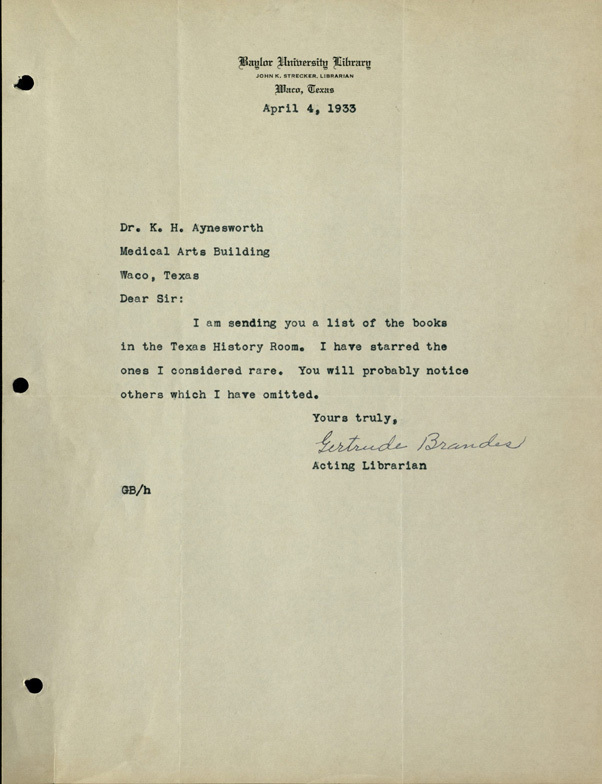 The Aynesworth papers serve as a testament to his emphases on the importance of family, the medical profession, and the preservation of history. 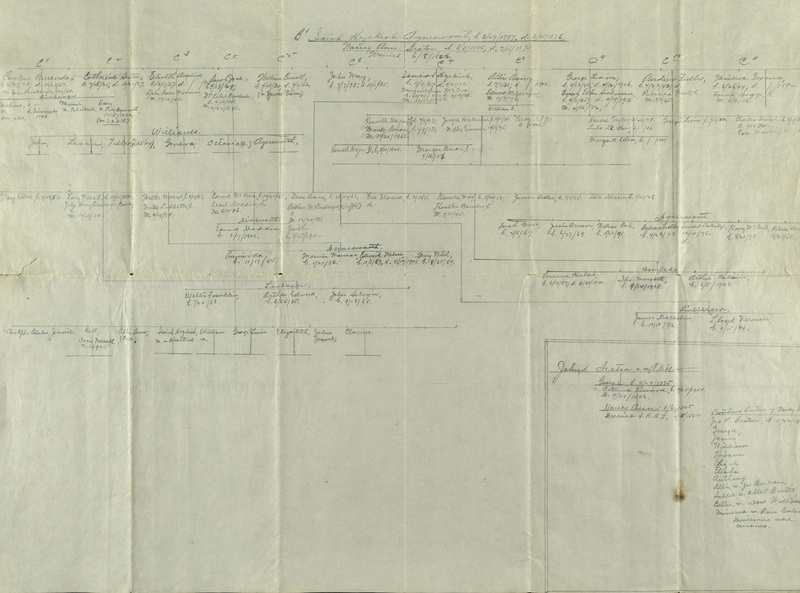 In addition to his interest in Texas and U.S. history, Kenneth Aynesworth also pursued family history, as demonstrated by this family tree on Isaiah Hezekiah Aynesworth, Kenneth’s grandfather.